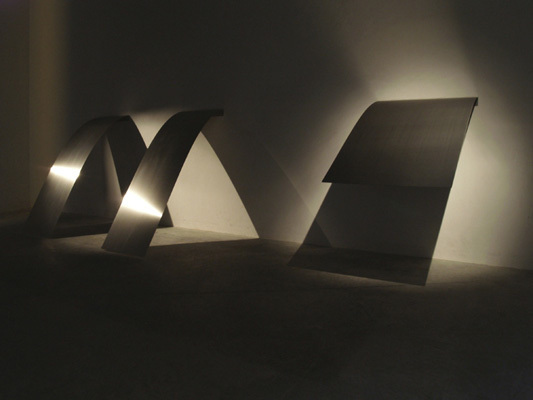 View of “Naama Tsabar,” 2008. From left: Night Falls-Tired Shelf, 2008, and Night Falls-Tired Shelf (Wide), 2008. This exhibition is twenty-six-year-old Israeli-born, New York–based artist Naama Tsabar’s Italian debut. On entering the gallery, one encounters Night Falls-Gaffer (all works 2008), a large sheet of white fabric, hanging from the ceiling, that nearly obstructs the entire exhibition space. The cloth has been treated with such products as glue and resin, which impart to it a strange sculptural stiffness and a painterly evanescence. One side of the cloth seems soaked in a milky substance, while the other is painted black and has an asphaltlike texture. Part barrier, part theater curtain, it also functions as a screen onto which Tsabar projects intermittent images of small flames and sparks produced by lighters. The flickering lights, which look like stars in a distant constellation, turn the large black surface into an improvised cosmic map. But club culture is a recurring theme in Tsabar’s work, and the projection, for all its simplicity, might actually depict some illicit back-alley or dance-floor encounter. Indeed, the sound track has something hypnotic to it. On the rear wall of the gallery, just behind the curtain, hang Night Falls-Tired Shelf and Night Falls-Tired Shelf (Wide), three sheets of aluminum that are wilted and bent as though they are victims not only of gravity but also of some emotional meltdown. Smooth, polished, yet uncomfortably precarious, they evoke Richard Serra’s prop pieces while also recalling the works of younger artists such as Kitty Kraus and Katja Strunz. However, Ysabar’s feel for simple materials, combined with a tenacious obstinacy, comes across as absolutely personal.